Help for Refugees - Buddy Bear Help e.V. 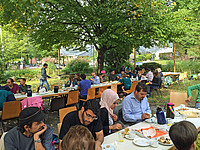 Since 2015, our association is actively involved in helping refugees here in Berlin. With great personal commitment, our members are helping wherever they are needed. One of the families accompanied by Buddy Bear Help e.V. Setting up a refugee settlement at Thielallee, Berlin. Buddy Bear Help e.V. funded building a mobile outdoor playground for a refugee shelter. We focus on providing help on a case-by-case basis. This means that the members of our association direct their support at individual families and underage young persons who need help from others if they are out of their depth in difficult situations. 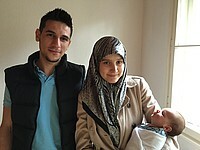 They may need support to organise medical care, get assistance to solve legal issues, to visit the authorities, search for accommodation and furnish this accommodation, to find a job, etc. The members of our association are very committed to their charitable work and help wherever they are needed. Cité Foch in Berlin-Tegel. 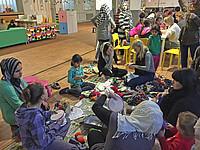 For several organisations with an equally great personal commitment to their work with refugee children, we fund materials and equipment that enable the children to play and to engage in handicraft activities and we fund entrance fees for events and venues. 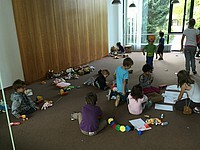 Learning the German language in the Protestant Church of Dahlem, Berlin. 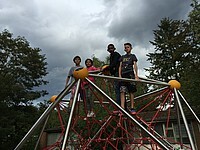 Co-operation with the Berlin International School. 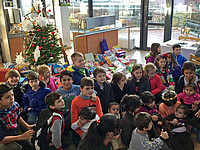 Cooperation with "Give something back to Berlin" in caring for refugee children and their families.